Here's the list of some of the best watercolour sketchbooks I've used over the years. The list is created based on my personal preference and is hence entirely subjective. The type of work I create is usually ink with watercolour, so I give more preference to sketchbooks that can handle that well. The list only has sketchbooks that can be bought. So I've excluded The Perfect Sketchbook and SPD Painter's Journal (with your own paper). I'll continue to update this list as I discover and use more sketchbooks. All the sketchbooks are linked to their individual reviews whenever possible. Khadi Papers is handmade paper from India. They are sold in loose sheets as well as in sketchbook format in different sizes. The sketchbook I bought was labeled smooth but it's more like coldpress rather than hotpress. The weight is 210gsm. 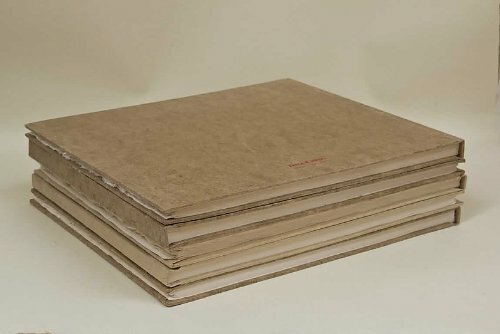 The cover is some of cardboard. The 100% cotton pages are deckle edge and looks and feels great. This paper handles pen ink and watercolour extremely well. Wet on wet techniques is a joy to use on this paper. Granulation appears gorgeous. It can take heavy washes. This is the wet on wet effect that can be easily achieved on the paper. I've not used any other sketchbook with paper that makes wet on wet so easy, and so beautiful. If you know of any, please tell me. The paper is thick enough so it does not make any impression from art from the opposite page. It warps slightly with heavy washes but because the paper is soft, it goes back into its flat state after closing the sketchbook. Binding is excellent and you can open it flat. The only downside, not quality related, is it can be difficult to find, and it's quite pricey if you're going to ship it from overseas. My review policy is such that I will only write a review after I complete a sketchbook, which can take months. But after the first few sketches in the Khadi sketchbook, I already know that this is the best watercolour sketchbook I've ever used. I'll still write a full and comprehensive review in the future after I fill this sketchbook. 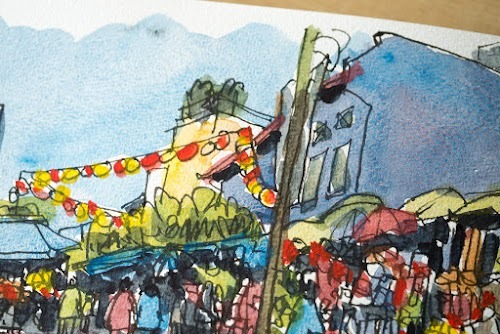 Khadi sketchbook is an excellent watercolour sketchbook, good for even mixed media. The paper is durable enough. The Pentalic sketchbook can take heavy washes although it will buckle slightly. Paper quality is excellent. The binding can be improved because I noticed that separate signatures can move apart with time. It's not as good for pen and ink work because the coldpress surface is relatively coarser with more tooth. But it's not a deal breaker and can certainly be used for pen, ink and watercolour sketches. The sketchbook used to be marketed with 100% cotton watercolour paper but many users found that it performs very differently from actual cotton paper. So they have remove the 100% cotton content description. Mechanical grain texture is discernible on the paper but it's not a big issue I feel. When you apply watercolour on it, the grain pattern isn't really that distracting. Also the texture is more obvious on one page vs the opposite page. Wet on wet is alright, but not as good compared to Khadi. Pentalic sketchbook is for those who like heavy washes. It can be used with pen and ink, but it's more suitable for the painters. This is part of the trav•e•logue series from Global Art Materials. It's very similar to the Moleskine sketchbook with some slight differences. The paper is white as compared to the creamy off-white of Moleskine. The cover is clothed. Those are the main differences. I prefer the coldpress paper here than the Moleskine. It's suitable for pen ink and watercolour. The sizing on both sides of the paper is more consistent. And it handles wet on wet slightly better than the Moleskine, but I would not have very heavy washes as well since it's still only 25% cotton. 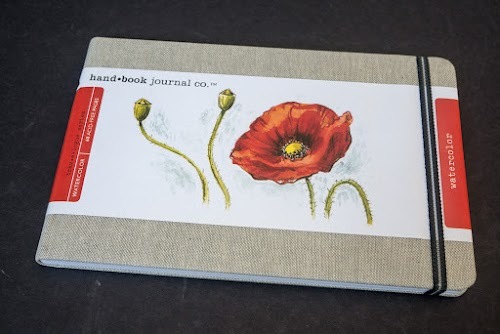 When it comes to non-100% cotton sketchbooks, this is top on my list. GAM watercolour sketchbook is for those who use pen and ink and light washes, and prefer white paper. 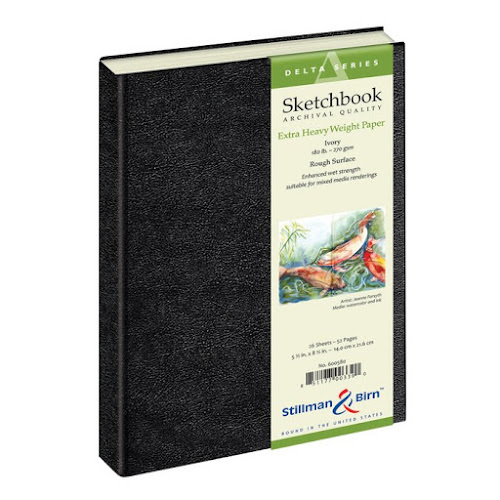 This is a good quality sketchbook that comes in paperback and hardcover format. The hardcover format is better because you have a solid backing to draw on. It handles water well even though the paper has no cotton content. It can also be used with a few layers of washes but it becomes increasingly difficult to do so. Use wet on wet with care as the paper is not as absorbent as cotton paper. So you should control the amount of water you use more carefully to prevent puddling. One downside is, for some reason, ink takes longer to dry. Or maybe it's the combination of Noodler's ink and this sketchbook. 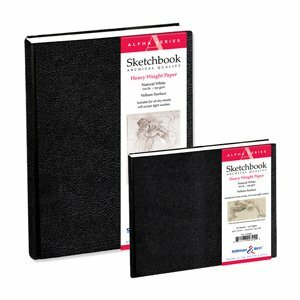 Strathmore sketchbook is for those who use pen and ink and medium washes. This is a lightweight watercolour sketchbook good for pen ink and light washes. The paper is white. If you prefer off-white, get the Gamma series. The paper will buckle with water as expected with only 150gsm. It's a good sketchbook if you want a lot of pages for quick sketches. I find that I'm more casual when sketching in this sketchbook precisely because there are more pages. Stillman & Birn has many sketchbooks with different characteristics. See the complete lineup. 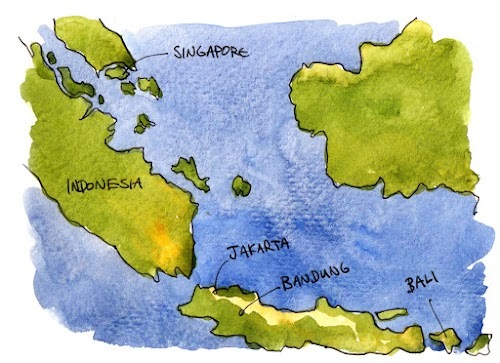 The Delta series features 270gsm off-white coldpress paper. The surface is smooth enough for line art. If you want white paper, that's the Beta series. It can take watercolour quite well. But since it's not cotton, it has limitations when it comes to wet on wet techniques. For Stillman & Birn 270gsm sketchbooks, sometimes the binding can be hit and miss. In this case, the gap became to big with constant usage. I know a lot of artists love the Moleskine watercolour sketchbook. However it's nowhere near the top of my list though. What I like about it is the overall feel. It's a very beautifully produced product. When it comes to the watercolour paper, I feel that it can be better. They have also recently changed the way they make the paper and that affected the quality. I spoke to a few artists and they preferred the earlier paper. Check out Liz Steel's review. The coldpress paper works well with pen and ink sketches. For watercolour, I would not go more than two layers because that's when it starts to buckle and I can also feel the paper will start to resist layering. Wet on wet can be a challenge as the paper does not really absorb the water that well. Water tends to stay on the surface for quite a while and can move around and affect colour blending. This can be a problem if you're working on a moving surface, such as when you're holding the sketchbook while drawing outdoors. 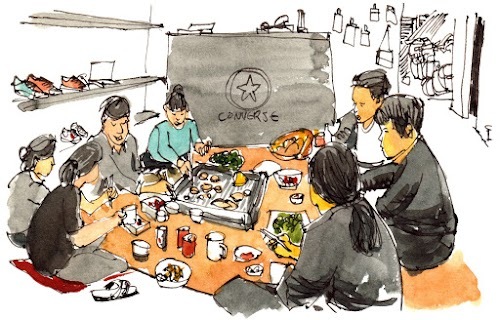 Moleskine sketchbook is for those who use pen and ink and light washes. I prefer using paper with at least some cotton content. It makes the paper more absorbent so that it can handle some wet on wet techniques. It doesn't really have to be 100% cotton unless you really need that kind of durability. Khadi Papers sketchbook is my favourite so far. It's the sketchbook for watercolour artists. And I feel that it's better than the rest by a good margin. Of course this is just my personal preference but I really enjoy using it, watching the pigment mix on the paper and how they dry into brilliant colours. Let me know what's your favourite sketchbook for watercolour sketches in the comments section below. Does the first one work with plain pencils? Khadi Papers is not suitable for pencil. Pencils work better on fine grain paper. Watercolour coldpress is too rough and hotpress is too smooth for pencils. I have a small Moleskine watercolor book. I found that ink and watercolor just seemed to sit on the surface as if the paper had been treated with a water repellent coating. I didn't like it at all. Then one day I tried wiping rubbing alcohol on the paper and let it dry and suddenly it was behaving much better--IMO, anyway. 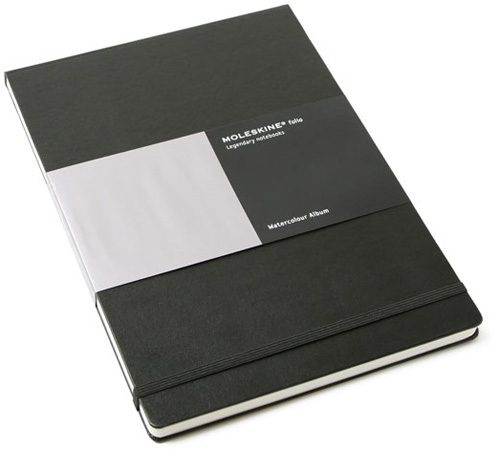 I've never felt the urge to buy another Moleskine book, though. It seems like too much trouble when there are so many other options. I'm not a big fan of Moleskine watercolor sketchbook also for the same reason you said. I've noticed that the S&B Alpha really affects the watercolour colour - they look dull. Is that the case with the S&B Beta/Delta or any other recommendations on here? Beta is just the thicker version of Alpha, and Delta is the off-white version of Beta. So they perform pretty much the same except for difference in paper thickness. Check out these two videos to see what the sketchbooks are capable of. Hi Teoh! The other day I found your YouTube channel. Great work! I don't think the Pentallic paper is cotton. Neither the packaging or their website mention cotton at all. I have one of their journals and I do like it anyway. I've got to update this old review. Pentalic used to market that journal as having cotton paper but after complaints, they have removed it. 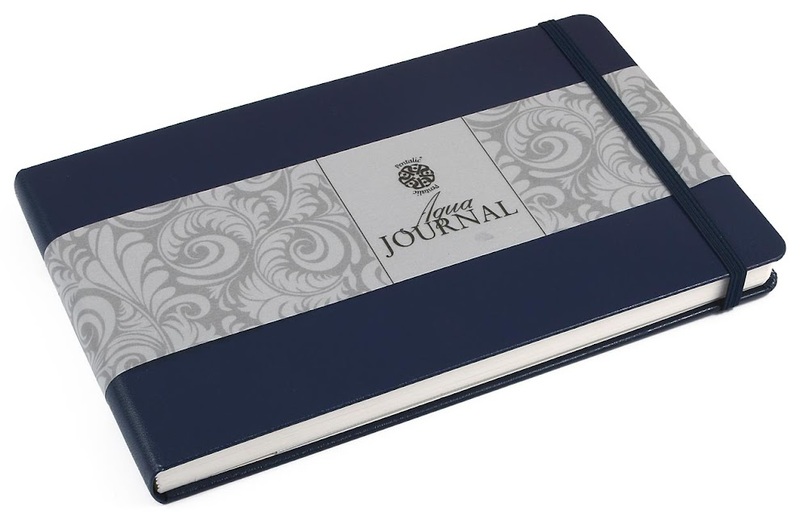 Have you tried Strathmore 500 Series Mixed Media Journal? Would love to know your thoughts on it. Strathmore 500 series Mixed Media Journal has very good quality paper for mixed media use.. But the paper is not as suitable for watercolour compared to watercolour paper because it's not treated for such use. Basically, it will be difficult to get really soft gradual colour blends or achieve wet-on-wet techniques. I'm currently using Mont Marte, 190 GSM watercolor book which is quite decent. I am planning to order a Khadi journal for an upcoming journey based on your review :) Will let you know my experience.